On February 15, 1965, Wildlife Park founder John Moelaert, proposed to the chamber that a zoological facility would be an attraction for both residents and visitors alike. The Kamloops Chamber of Commerce felt that Kamloops was a ‘one-night stop’ and needed more attractions so that visitors would stay longer and benefit the economy. A Chamber sponsored public meeting on March 17th, 1965, in the old Kamloops Library to discuss the possibility of establishing a Wildlife Park. This quickly led to the formation of the Greater Kamloops Zoological Society, which was registered under the Societies Act on March 31, 1965. The Society’s first task was to find a suitable site and soon entered into discussions with Molson’s Breweries who owned a hop farm to the east of the city. In February 11, 1966 Molson’s Breweries officially donated 106 acres of land to be used ‘in perpetuity’ as a wildlife park. On August 16, 1966 the first exhibits were opened to the public. 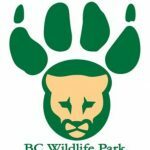 Over the fifty year history of the Society, the BC Wildlife Park has been continually enhanced through the tremendous support of volunteers and business professionals throughout the province. Today, the Kamloops Wildlife Park Society is governed by a volunteer board of 14 directors elected at the Annual General Meeting from a membership of over 8,000 people. The BC Wildlife Park attained national status in 1987 when it received accreditation from the Canada’s Accredited Zoos and Aquariums (CAZA). To contribute to a future that embraces conservation of wild ecosystems, biodiversity and a healthy natural environment. To encourage the appreciation of and respect for BC’s wildlife, and to assist in preserving biodiversity through education, research, captive breeding and rehabilitation services. The BC Wildlife Park connects people to BC’s wildlife and wild places in order to encourage a sustainable society within a healthy natural environment. The New Vision is to develop the facilities and the on site and extension programming in partnership with government and the private sector to interpret BC wildlife and promote sustainability to all people in BC and nature tourists from around the world.